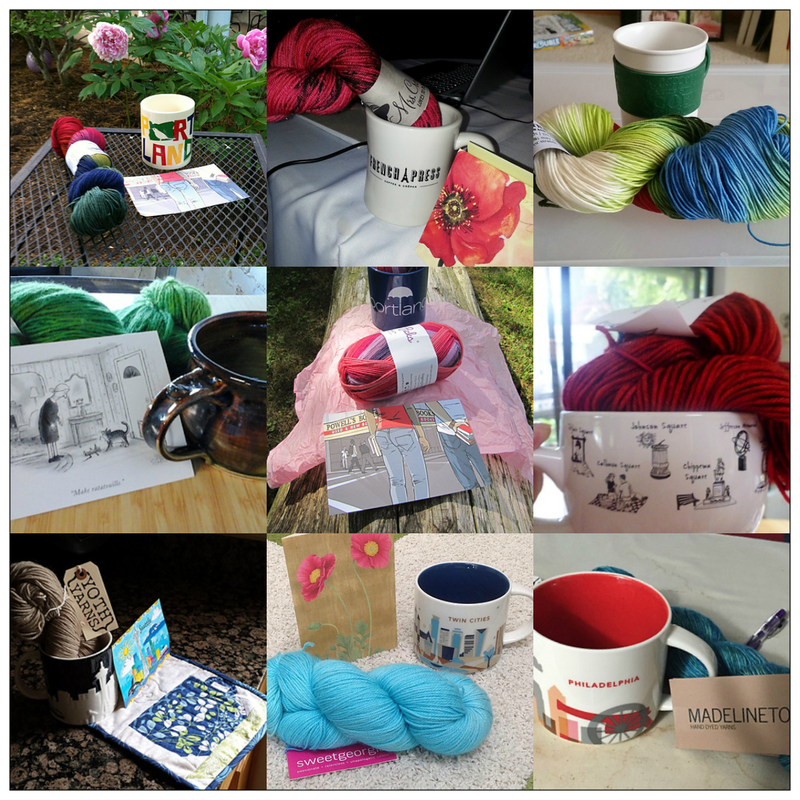 The 2015 Columbia Gorge Fiber Festival was wonderful! Amazing, inspiring, fun, local(ish), lovely – a great success!!! Held November 6-8th at the Fort Dalles Readiness Center, this was truly a first-class event. I traveled up with my good friend and fellow designer, M.E. Greene, Olive Knits. We had so much fun on our road trip, seeing the beautiful Oregon countryside on the way up and back, and waxing rhapsodic about the entire experience on the way home. I was fortunate to be able to take three classes. On Friday afternoon, I took Stephanie Pearl-McPhee’s class, Knit Smart. Stephanie is a kick in the pants. If you have read any of her books, you might imagine that she could be a stand-up comedian. She’s the same in person…she has that comic timing thing down pat. At any rate, the class was an overview of knitting principles: basic concepts that we may or may not have picked up in today’s less formalized approach to knitting education. Most interesting to me were learning about the components of knitted fabric: courses and wales. I was also interested in causes of consistently loose or tight knitting. …OK, well. My pictures of that class are completely blurry and useless. So instead, I’ll send you to Stephanie Pearl McPhee’s website. Her take on her visit to Oregon is hilarious and spot-on at the same time! The Saturday classes I took were near and dear to my heart. Marie and I took two classes from a favorite sweater designer of both of ours, Norah Gaughan. Her designs are amazing. I particularly enjoyed slide shows in which she shared the inspiration for many of her designs. The classes were Creative Geometric Design and Knitting Polygons. So much fun! Norah was a sweetie and her classes were such fun, too. Norah demonstrating using a geometric shape in design, and Marie modeling. Next, we got to work with the fleece we brought to come up with our own creative design based on geometric shapes. We learned that fleece is great for this because it drapes in much the same way as knit fabric and so is great to use for templates. Here I am – this one is going to have a square neckline. In the afternoon class, we worked with fun shapes such as pentagons and hexagons. You can see them in the edging of the sweater I’m modeling below. It’s one of Norah’s, which I borrowed just for this picture. I wanted to take it home with me! It fit like a dream. Marie and I were total fangirls! Left to right: Me, Norah Gaughan, Marie. Marie and Norah wearing sweaters of their own design. The other two things I love about Fiber Festivals as Travel Destinations are the people – both new and old friends – and the fiber. This festival was no exception! Saturday night there was a banquet, with Stephanie Pearl-McPhee as the keynote speaker. I got to hang out with Marie and these two friends, Leanne and Martha. The four of us met for breakfast Sunday, as well, and had such a lovely time! Stephanie’s keynote speech was very inspiring, and funny, of course. She began by mentioning the propensity of some to aver that many of us are “addicted” to knitting, yarn, and the fiber arts. As you can imagine, there are many appropro comparisons. But in reality, we knit because we know it’s good for us. It makes us better. We are happy when we have faced and overcome something that is a challenge to us. That’s what’s great about knitting, there’s always something new to learn and to try. It’s also why I love designing! 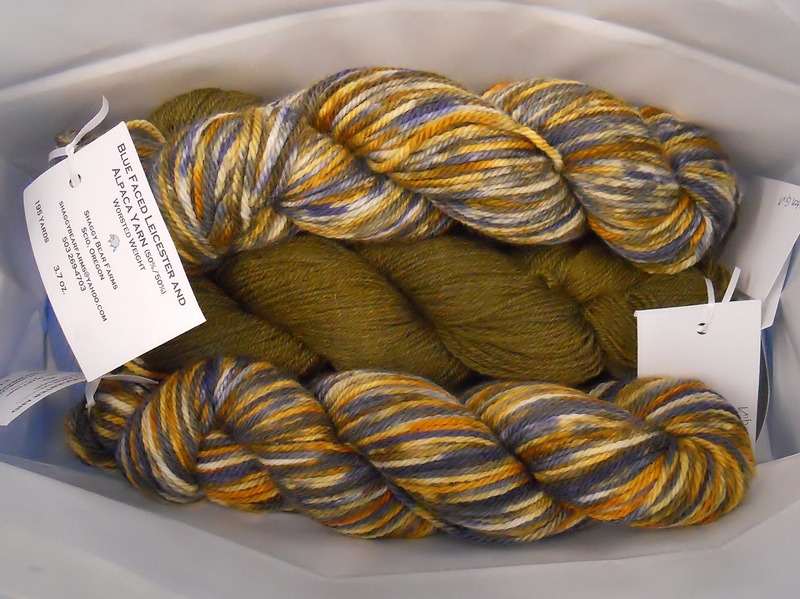 I just can’t wait to get my hands into this beautiful yarn!!! Can’t wait to see what it will become! The trip home was filled with chatter, with exclamations about the inspiration we had garnered from the instructors and speakers. The landscapes on the drive home seemed especially beautiful – sunlight through rain creating such depth of color. So blessed to live where there is such beauty. And finally, the whole festival was done so well. Everything was top quality, from the venue to the marketplace to the slate of instructors and the banquet. I’m already thinking about the CGFF 2016! You two are so cute. How neat fleece helps with design. I wasn’t able to view your stash enhancement pic on my phone. I’ll look again when I get up later this morning. I uploaded that picture again…I think it’s working now.